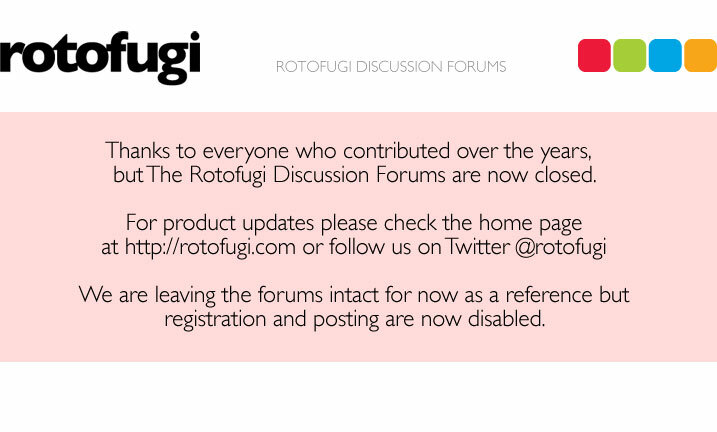 Rotofugi Forums • View topic - Server Move - Done! < Other Announcements ~ Server Move - Done! Please Note: Our online store will be offline this evening beginning at 9:45 PM Central Standard Time to perform some maintenance and upgrades. If all goes to plan we should be back in a few hours. If you would like to place an order, please make sure your order is in prior to 9:45 pm. Thanks for your understanding! The online store is off now....probably right around 10pm central time the online store server will be down completely for 15-20 minutes. We'll be back up, but not operational for an hour or two after that downtime...then back to normal (except hopefully faster and without database connection errors) around Midnight Central. Had a little hiccup so the server is going back down for another 15-20 minutes. Keep your fingers crossed! FYI, if anyone is interested....we were moving everything to a faster server with more RAM and moving our database as well. We should see better performance when we do things like the Warehouse Moving Sale or during big releases now. Woot! We're doing one last upgrade to software and will be up and running right around 1:30 AM Central Time.